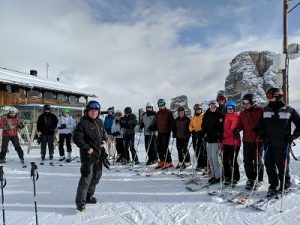 The Bear Valley Ski Club usually alternates between Europe and North America on our annual ski trips. The North American ski trips are one week in length. The European ski trips are two weeks, with the first week at a ski resort and an optional extension traveling and sightseeing. You must be a member of the Bear Valley Ski Club before you can sign up for our Annual Ski Trip. It’s not expensive – sign up now and join us! The circuit around the Sella mountain massif leading you over 4 Dolomite passes, is an extraordinary tour which provides magnificent views. Our Ski Trips are booked through Snow Tours, Inc.